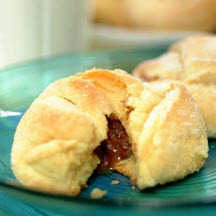 These warm crescents, with a melted chocolate candies inside, are sure to be a hit with kids of all ages. Preheat oven to 375°F (190°C). Spray baking sheet with nonstick cooking spray. Unroll dough; separate into 8 triangles. Sprinkle triangles lightly with 1/2 tablespoon sugar. Place one Nestlé Treasure on each triangle at the shortest side of the triangle. Starting at shortest side, roll up each triangle, enclosing the Nestlé Treasure while rolling. Curve ends of triangles to form crescent shape and to completely enclose Nestlé Treasure. Sprinkle each crescent with remaining sugar; place on prepared baking sheet. Bake for 11 to 13 minutes or until golden brown. Cool for 5 minutes before serving.